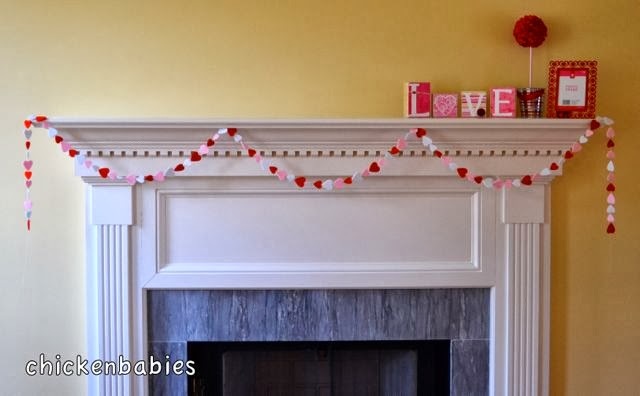 I had seen cute felt heart garlands on pinterest and wanted to make one for my mantle. The ones I had seen were made of hearts cut from felt and sewn together in a line, but I had no desire to cut out a bunch of hearts. I started looking around and found some pre-cut felt hearts, but they were the peel-and-stick variety. I thought "I can't sew through those! But wait . . . . I could just stick them back to back around a string and then I could even skip the sewing part! Yes!" And that's what I did. I found these packs of Stick-it-Felt Heart Shapes at a local store and bought a few of them. The packs come with two different sizes of hearts in 4 colors. I used just 3 of the colors (I didn't care for the hot pink). I took the paper back off of a couple of hearts, laid a thread down the middle of one and put the other sticky heart on top. I just continued sticking them to the thread until it was as long as I wanted. The felt hearts have a nice weight to them. I'm happy with how it turned out. 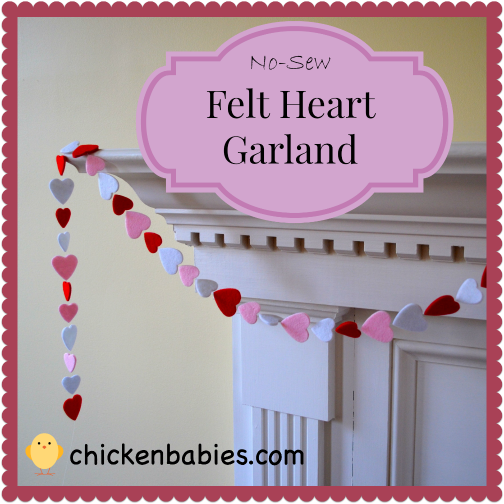 My garland is about 10 feet long. It was not so long at first, but I left string on each end when I first hung it up. When I decided I wanted some hearts hanging from side, I just made a new strand, tied it to the first one about a heart apart, and then stuck a new heart over the knot. Did that make sense? My mind is a little fuzzy tonight. The kids really enjoyed helping with this project. It's pretty simple and they can do it on their own (although I had to lower my expectation that the hearts would be lined up perfectly). 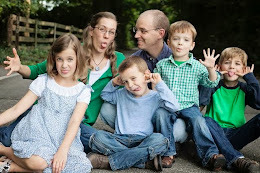 They want to make lots more to hang around our house and their rooms. So cute! And much easier than sewing. Looks great! It turned out so cute! I want to go try it now. Thanks Kara! And it's soo easy. Plus you can do just a bit at a time if you need to, adding a heart here and there between other activities.